Lucky Cat Museum owner Micha Robertson surrounded by hundreds of beckoning cats. It started innocently enough. I was looking up directions online when there it was on the screen, "Ohio's Lucky Cat Museum." Ohio has a Lucky Cat Museum? Immediately I knew it would be a purrfect summer story and that I must visit right meow. Micha Robertson is the owner, operator and self-described "crazy cat lady behind the Lucky Cat Museum." 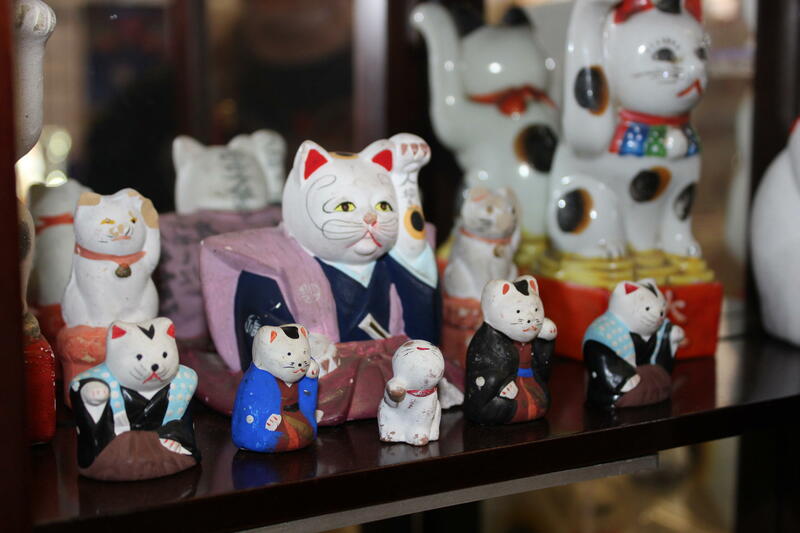 "Basically it’s an ever-growing collection of Japanese maneki neko, which is the ‘beckoning cats,’" says Robertson. "People most often see them in Chinese or Japanese restaurants. It’s the little cat with its paw raised." Ohio's Lucky Cat Museum includes every type of lucky cat you can imagine from plastic, Hello Kitty-themed cats to rare collectibles. 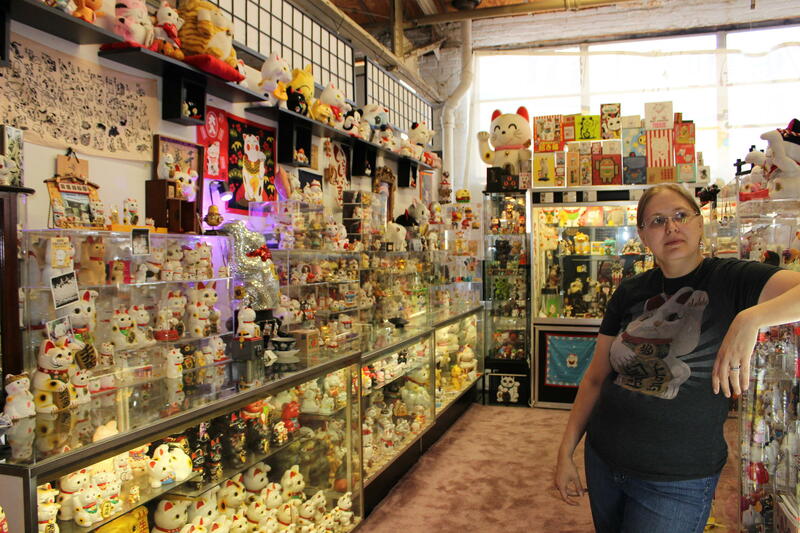 Robertson started collecting lucky cats about 10 years ago and estimates she has more than a thousand. "For me," she says, "it’s just taking a basic idea – (it’s) not just a cat, but it’s a cat with its paw raised – and it’s interpreted so many ways. Each one is very different from another. Even the ones that are the same basic look are still very different. I love seeing how many different ways it can be interpreted. And the weirder they are, the more I love them." Row upon row of meticulously arranged smiling cat figurines line a small space at Essex Studios in Walnut Hills. There are big ones, teeny tiny ones, holiday-themed cats, some are toys, and some are clearly valuable collectibles, so paws off. “I can show you the most popular one we have,” says Roberston. She claps her hands and a plush lucky cat springs to life dancing side to side. She sings along as the cat bops around. 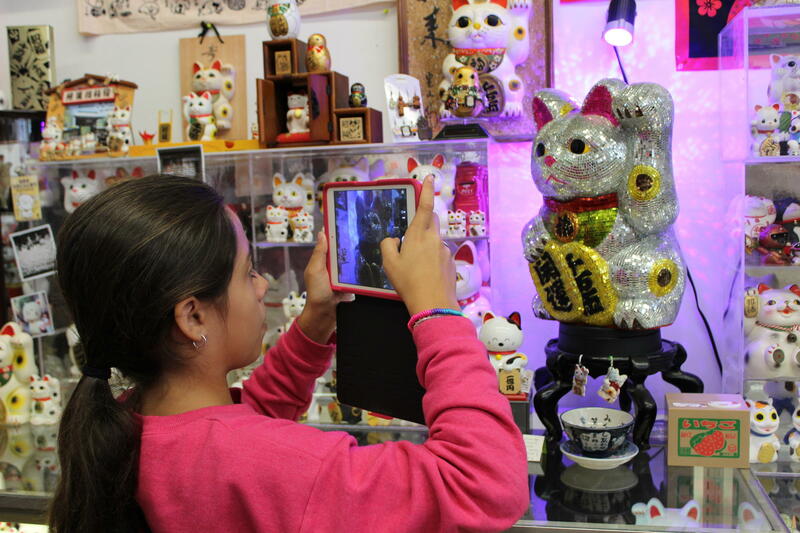 Isabella Rivera snaps a picture of her favorite piece at the Lucky Cat Museum. There's also a box-shaped bank with a cat paw that reaches out and snatches coins for safe keeping. That makes Isabella Rivera giggle. She and her dad are visiting from Florida. This lucky cat refuses to beckon: the original grumpy cat. There are a lot of cats. Pokeman-themed cats, Hello Kitty-themed cats, phones shaped like cats, a giant inflatable cat, bobbleheads, a lucky cat casino game, and even one plump little guy that unlike all the others refuses to smile or raise a paw: the original grumpy cat. When does the museum curator decide she has enough lucky cats and stop collecting? "Oh never… never, never," Robertson says. Robertson says lucky cats or maneki neko are good fortune symbols, especially for businesses. A raised right paw calls for fortune and prosperity, the left paw for bigger crowds of customers. According to Japanese legend, the very first lucky cat, Tama, beckoned a man out from under a tree and into a temple during a bad storm. Robertson picks up the story. "As soon as he reaches the cat, lightning strikes the tree. So he thinks ‘Oh my gosh, this cat just totally saved my life.’ And he makes the temple his family temple. It does exist. It is Gotokuji in Setagaya, Japan. 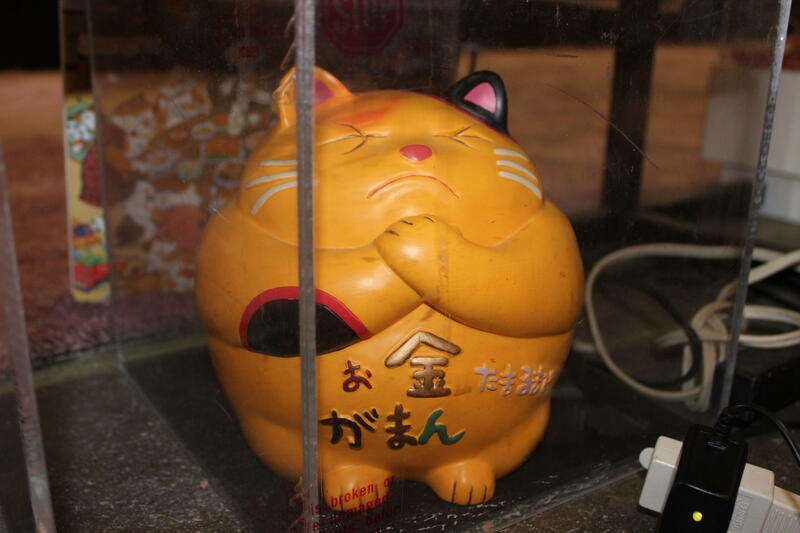 Supposedly that original lucky cat, Tama, is buried there." These maneki neko are older and feature more traditional cat faces. Robertson says the rounded face design seen frequently in Chinese and Japanese restaurants today was popularized in the 1950s and remains the most common lucky cat design. 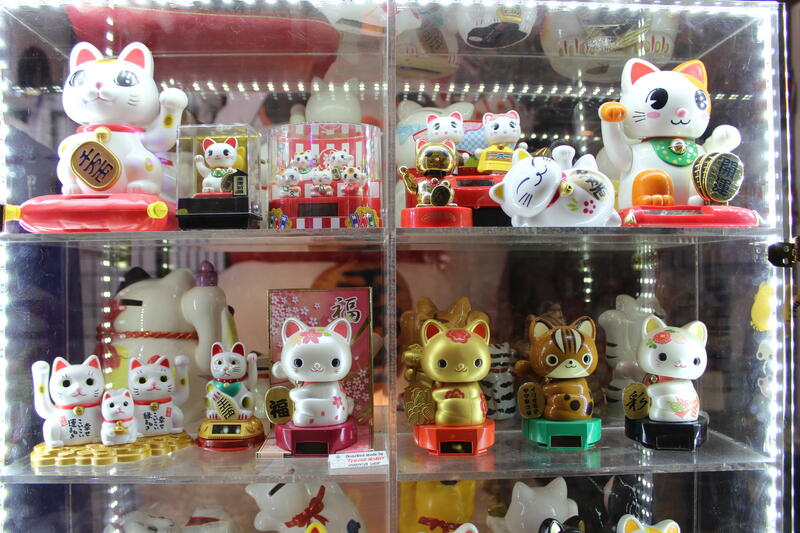 Robertson says visitors can purchase lucky cat figurines at the temple site and many then leave them there as a shrine to Tama. Robertson has a few of those figurines in her collection, but they were all sent to her or ordered online. It turns out she's never been to Japan herself... but it's definitely on her 'to-mew' list. Visiting the museum is by appointment: manekinekomuseum@yahoo.com or call/text 513-633-3923 to schedule. Oct. 2 & 3, Friday & Saturday from 6:00 p.m.-10:00 p.m.
Nov. 6 & 7, Friday & Saturday from 6:00 p.m.-10:00 p.m.
Dec. 4 & 5, Friday & Saturday from 6:00 p.m.-10:00 p.m.
What Walk-Up Song Would You Pick? 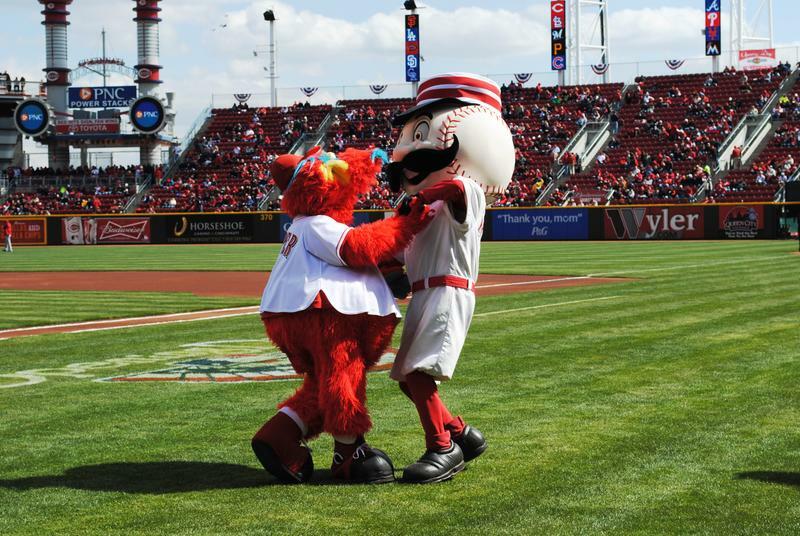 The Cincinnati Reds DJ will be working extra hard during Tuesday night's All-Star Game. Normally he only has to play walk-up music when the Reds are at-bat. But Tuesday he's charged with dialing up tunes for all the players.